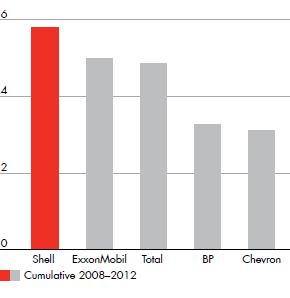 Technology and innovation provide ways for Shell to stand apart from its competitors. They help our current businesses perform, and they make our future businesses possible. Over the last five years our spend on R&D averaged more than $1 billion annually – more than any other international energy company. In 2012, R&D expenditures were $1.3 billion, compared with $1.1 billion in 2011 and $1.0 billion in 2010. Sustained investment in our key business technologies pays off. The Pearl GTL plant in Qatar, for example, is the culmination of almost 40 years of dedicated investment in gas-to-liquids (GTL) R&D. As a result, we hold some 3,500 patents related to all stages of the GTL process. And there is more innovation to come, with a view to increasing the capacity of existing GTL plants, reducing the cost of the catalysts and reducing the CO2 emissions.